103117: We’re at the Campbell Hall This Friday! We’ll be at the Campbell Hall this Friday, 6:30p-9: ish, Mahalo Nui Loa to Reverend Chip for Hosting us once again! It’ll be nice be back in that beautiful space again. BYPotLuck, BYOGear (Music Stands, Book Lights, UKULELE, etc.). Were good for chairs but can use help with setup. OH, don’t forget to bring some Aloha to spread around too . . .
Saturday we’ll be back at the UFOHQ, 2p-4p. BYOB&S (Beverages and Snacks). We’re good for chairs, but you may need to bring a music stand just in case and a six pack of Aloha couldn’t hurt either. 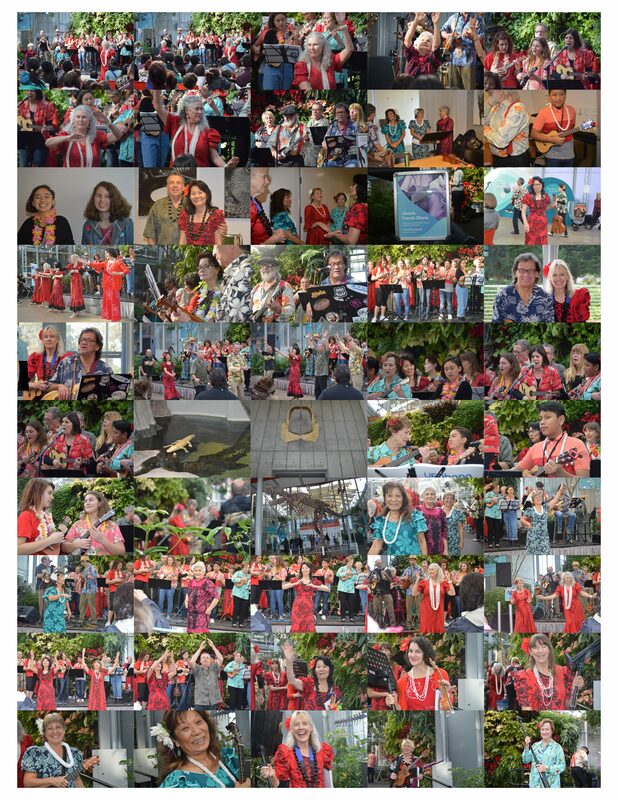 Mahalo Nui to All that made our Come As You Aren’t Kanikapila such a fun and fantastic event. Click the collage below to view the only album. Mahalo to Donna and Linda for the fun pics! The following Saturday was our last Kanikapila at the Sonoma Valley Woman’s Club for the year. We’ll be back with our Sonoma ‘Ohana in January 2018. Mahalo to Craig and Linda for the great photos! Mahalo to the Sonoma Valley Woman’s Club, Betty Ann and Hula Mai for a great 3rd year of Kanikapila in Sonoma and for the beautiful lei. We’ll miss you folks, please do visit us down South sometime! Btw, in case anyone’s in the area . . . check out the following . . .
Hope you all had a Great Halloween. After all the years of not having any Trick or Treaters show up, we just had a hoard of Vampires, Witches, A Tyrannosaurus Rex (see below), Harry Potter and a Pirate decimate our bowl of candy. After less than1 minute a 10 pound bag of Candy was gone except for a Butterfinger and Baby Ruth. Thankfully that was the first and last group for the night! I wonder if this comes in XXXL? This one didn’t show up, but I really like his costume! Edward Jr? I AM The BAT CAT . . . . Previous PostPrevious 102517: This Friday Is “Come As You Aren’t Day” at the UFOHQ . . .
Next PostNext 110617: We’re at the Elks This Friday, Sat. we’re @ UFOHQ Day & Elks Evening . . .